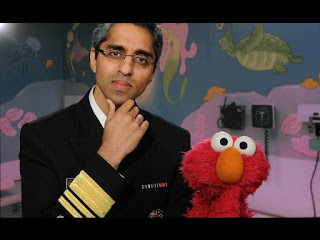 Although it is not unusual for hold-over appointees from the previous administration to serve in caretaker capacity until an incoming regime can fill positions, the fact that Dear Leader abruptly called for the dismissal of the incumbent Surgeon General of the United States on a Friday afternoon so the news might get buried and with no replacement waiting in the wings (and few lined up in general) seems a bit suspect. Dear Leader, on the eve of the March against Alternative Facts, might have decided to fire America’s Top Doctor for a number of reasons, including labelling gun-violence and opioid-use a matter of public health or for saying that vaping was not such a stupendous alternative and may prove a gateway to other more damaging habits, but it was most likely his recent appearance with puppet and stooge (and degenerate) of the immunizations racket to argue that vaccinations keep us all safe and healthy. Many of Dear Leader’s core supporters, we’ve heard tell, are of the conviction that immunizations cause autism and a whole host of ills and would rather tempt the ravages of medieval diseases that had been all but eliminated in the West, and so the physician had to be replaced with one of his lieutenants—making her the first individual to hold the office without a medical background, which seems a bit important.